Fabrique d'Horlogerie de Fontainemelon was set up in 1793 to supply the Swiss watch industry with ébauches (bare movements) to reduce reliance on the supply of ébauches from France, principally Japy at Beaucort in the region of Besançon. In 1841 the Journal Suisse d'Horlogerie recorded that over the previous 40 years the Fontainemelon factory together with Japy at Beaucort had supplied nearly all the ébauches used by the watchmakers in the cantons of Neuchâtel and Berne. The name of the village or municipality of Fontainemelon is derived from fontaines mille, literally a "thousand springs", reflecting the numerous small springs or water sources in the area. The first written mention of the village is dated to the year 1350 under the name Fontainnemelom. It was a farming community until the end of the eighteenth century when a textile factory was opened. The village of Fontainemelon is at 864m above sea level. It is 8 km north-northwest of Neuchâtel, abut half way between Neuchâtel and La Chaux-de-Fonds, in a scenic location on the northwestern edge of the Val de Ruz in the Swiss Jura mountains. The highest point of the municipality is 1,230 meters above sea level. The watchmaking company was founded in 1793 as Fabrique d'horlogerie Benguerel & Humbert by Isaac and David Benguerel and Julien and François Humbert-Droz. At first outworkers were employed, working in their homes in the traditional Swiss system called établissage, but later a factory was constructed and workers brought under one roof. In 1797 the company employed 120 workers, half of whom worked at home and were paid for each piece they made rather than for the hours they worked. The employment of workers in a factory with powered machinery was the first move in Switzerland towards the mechanised manufacture of watches. Power for the factory was at first provided by teams of oxen turning a wheel that through gearing drove horizontal shafts that entered the factory and ran above the workbenches. Machinery was driven from these overhead horizontal shafts by vertical belts that ran around pulleys on the shafts and on the machines. Jacob Robert was born on 6 August 1792 in La Chaux-de-Fonds, son of Jacob Robert, a watch manufacturer and trader, and Suzanne-Marie Sandoz. In 1819 he married Melanie Humbert-Droz, daughter of Julien Humbert-Droz, one of the co-founders in 1793 of Benguerel & Humbert in Fontainemelon. In 1821 Jacob joined the company co-founded by his father in law. In 1823 he was made a partner in the company along with his brother Frederick Robert and Antoine Fornachon. This effectively amounted to a takeover of the company by the Robert family. Swiss companies that were private partnerships had by law to be named after the principal partners. The company was renamed "Robert & Cie", although it continued to trade under the name of Fabrique d'horlogerie Fontainemelon. A new, larger and two story, factory was built, which was still visible in the twentieth century. In 1838 Jacob Robert's eldest son, age 10, was caught in the gears of oxen powered machinery and killed. His distraught father had the machinery involved destroyed. It was replaced by new, safer, machinery. A steam engine was installed in about 1860, again driving machinery through overhead shafts. Electrification followed later, when electrical power and electric motors became available. The Journal Suisse d'Horlogerie says that another company reorganisation took place in 1841. Experienced watchmakers were brought in to supplement the in-house workers and new calibres were designed. Jacob Robert left the company in 1842 and was was succeeded in the management of the company by his son Henri Auguste Robert. Jacob Robert died on 6 February 1865 in Neuchâtel. In 1876 the company was incorporated as Fabrique d'horlogerie Fontainemelon S.A. In 1881 the company employed 400 workers and was producing 240,000 ébauches a year. When Auguste Robert passed away in 1907 his cousin Paul Robert took charge. Maurice Robert, a fourth generation member of the Robert family, took over in 1912. By 1913 output had risen to one million ébauches a year. The main road through the town is named Avenue Robert in recognition of the importance of the Robert family and their watch factory to the economy of Fontainemelon. Today ETA S.A. Manufacture Horlogère Suisse are still to be found at 13 Avenue Robert. The advert here was published in 1915. It says that the company was founded in 1823, which refers to the takeover by the Robert family. Later adverts revert to the earlier date of 1793 for the foundation of the company. The advert shows the Fontainemelon trademark of an arrow through an apple, which was registered by the company in 1891. This is a reference to William Tell, the folk hero whose defiance in 1307 of Gessler, a representative of Habsburg Austria, led to the famous apple shot from the head of Tell's son, the imprisonment and escape of Tell, followed by his assassination of Gessler, a subsequent popular rebellion against Habsburg rule, and the formation of the Old Swiss Confederacy. In addition to ébauches the advert offers finnisages and sertissages, finishing and jewel setting. The types of movement available are "Clef, Bascule, Remontoir. Clef means key wound and remontoir means stem wound. Bascule means a lever, so this is probably referring to the type of lever set movements required by railway companies. The lever made it more difficult to set the time, reducing the risk of it being altered accidentally. Many Fontainemelon ébauches carry the number 51482 stamped onto the bottom plate. This is a reference to Swiss patent CH 51482, which was granted to Fabrique d'horlogerie de Fontainemelon on 3 May 1910 for a Mécanisme de remontage et de mise à l'heure; a mechanism for winding a watch and setting the time. 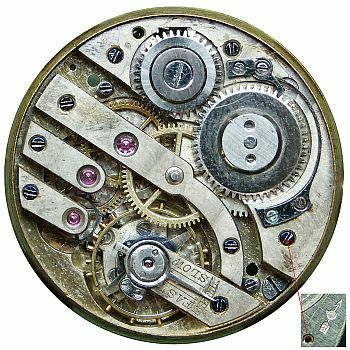 In addition to winding the watch by the crown and stem, the mechanism described in the patent allowed the hands to be set by pulling the stem out and turning the crown, called stem setting or stem set. 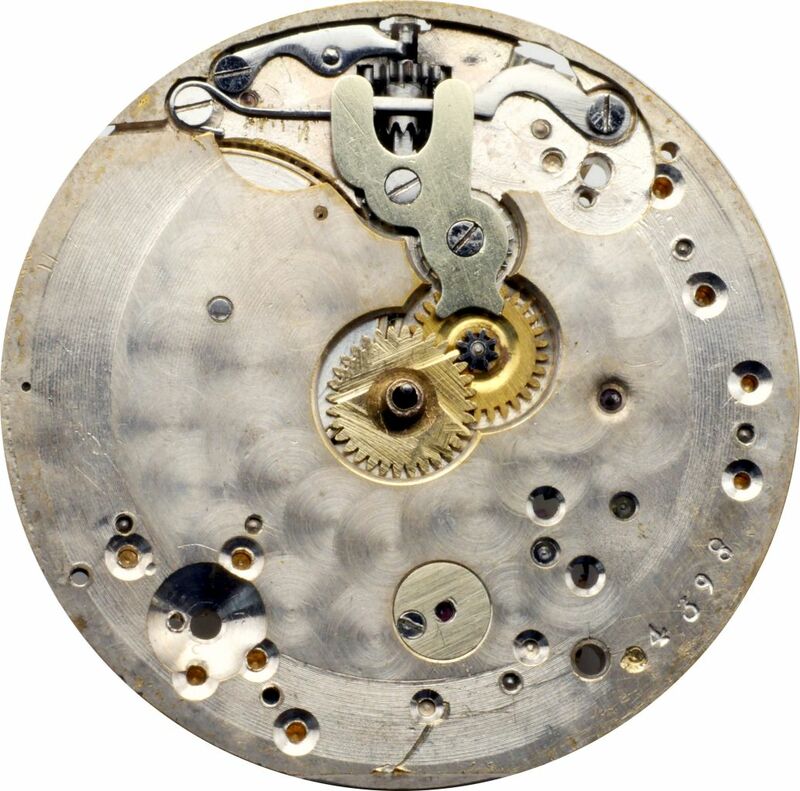 The mechanism, or "keyless work", that allowed this was a variation on the sliding sleeve mechanism invented by Adrien Philippe in 1845. 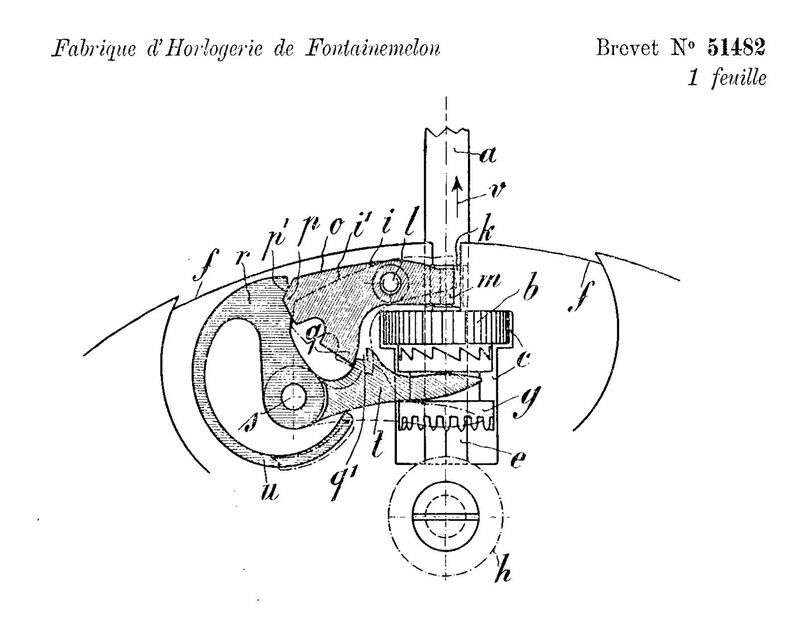 In common with many patents taken out on winding and setting mechanisms based on Philippe's invention, the Fontainemelon patent concerned the arrangement of levers, springs and detents that moved the sliding pinion between the winding and setting positions and held them in the correct position. In the figure from the patent you can see the Philippe pinions clearly, the crown or winding pinion is labelled b, the sliding pinion g.
The implementation shown is stem set. Pulling upwards on the stem causes the setting lever to press down on the yoke engaged in the slot around the sliding pinion. The yoke rotates around its securing screw as shown by the dotted lines and the sliding pinion is pressed downwards into the hand setting position. When the stem is pushed down, the semi circular spring pushes the yoke back, which returns the sliding pinion to the winding position. 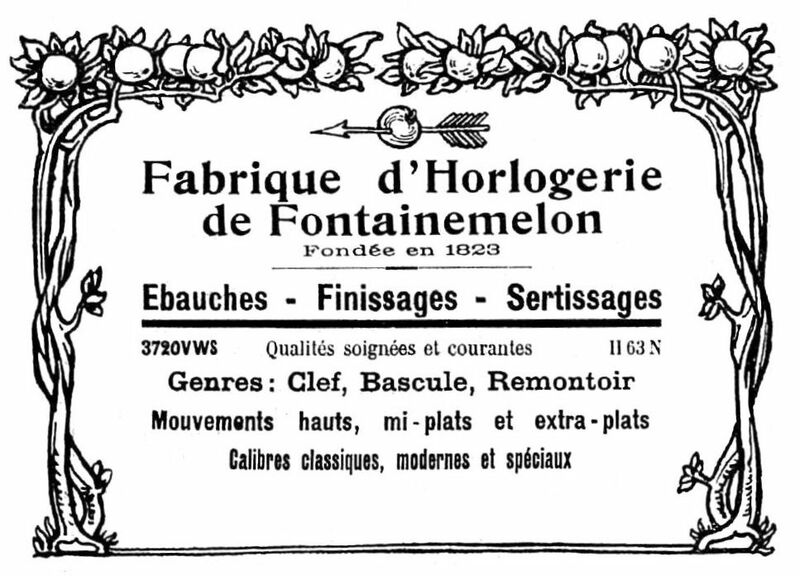 Fontainemelon used two principal trademarks, the ‘William Tell’ mark of an arrow through an apple, which is also shown in the advert further up on this page, and the initial letters ‘FHF’ from Fabrique d'Horlogerie de Fontainemelon with the first F reversed to make ꟻHF. An example of this can be seen on the FHF Calibre 30 ébauche shown further down this page. The ꟻHF trademark took on various forms over time. A later version of the ꟻHF trademark is shown in the smaller image. The shield around the initials shows that the company by then was part of ETA, which is discussed the section below about the creation of ETA. Some Fontainemelon movements carry the brand name ‘Forward’ on their bottom plates. As forward is a common word used in everyday speech this was not a great idea and didn't last. You can see a number of examples of Fontainemelon early wristwatch ébauches on my page about Movement Identification. Early Fontainemelon wristwatch ébauches that do not carry the trademarks used later by the Company can often be identified by their keyless work. The image of the bottom plate of a Fontainemelon ébauche here shows the very characteristic "y" shaped cover plate that keeps all the parts of the keyless work and setting wheels in place. In the image of the top plate of an ébauche shows the Fontainemelon trademark of an arrow through an apple, a reference to William Tell, This trademark is on the top of the bottom plate, underneath the barrel bridge. Because of this it can't be seen even when the dial is removed, it can only be seen when the movement is dismantled and the barrel bridge is removed. 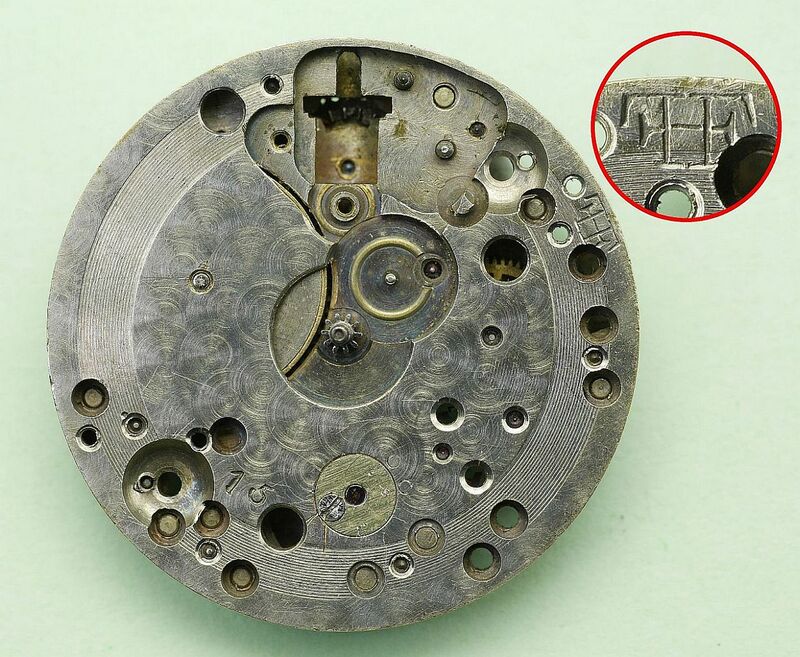 Why Fontainemelon and other Swiss manufacturers went to such lengths to hide their trademarks is not known, but it is probably to disguise the source of a watch movement from the end customer. The Fontainemelon William Tell trademark of an apple with an arrow through it is shown in the bottom right corner of the picture. It is hidden under the barrel bridge; a red arrow indicates the barrel bridge screw which fits into the screw hole shown in the cut out. FHF Cal. 30 Bottom Plate: Click to enlarge. FHF Cal. 30 Top Plate: Click to enlarge. This ébauche is a Fontainemelon calibre 30, cal. FHF 30; it was also made in a centre seconds version FHF 30-1. It's a 10½ ligne diameter round movement ticking at 18,000 vibrations per hour. 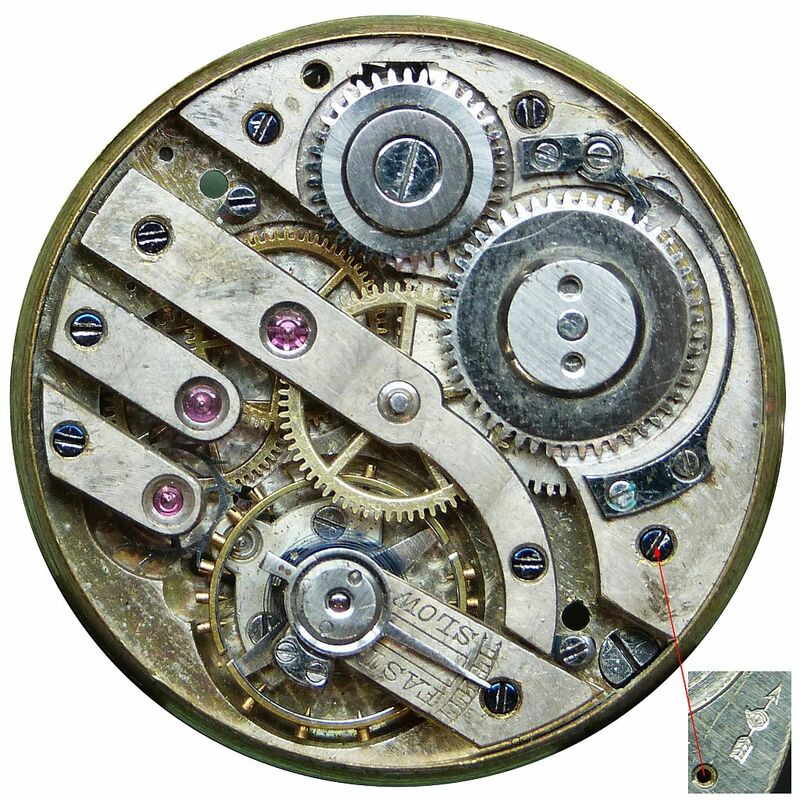 It has a Swiss straight line lever escapement and fifteen jewels, so it is a good quality movement. It was also made in a 17 jewel variant with end stones for the escape wheel bearings, and an indirect centre seconds version called the FHF 30-1. 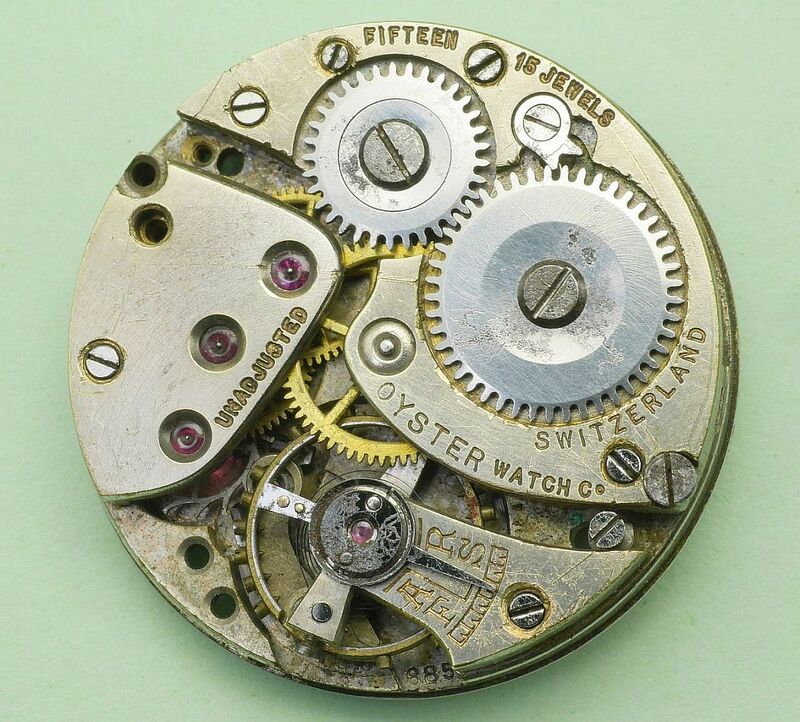 This ébauche was widely used in the Rolex Watch Company's ‘other brand’ watches such as Oyster Watch Co. and Tudor. In Tudor watches it was called the calibre 59 and the centre seconds version called the cal. 59(SC). Although the Tudor version is usually described as being ‘based on’ the Fontainemelon movement, the only modification seems to be the engraving of the Tudor name on the bridge. In 1925 Ébauches SA was formed as an association of 26 ébauche makers, including Fontainemelon, A. Schild, ETA (at the time the movement division of Eterna), and a number of other Swiss ébauche makers. Each member of the association had a logo based on their initials within a common shield. The Fontainemelon company was acquired by ETA in 1984 and today the whole company is called simply ETA S.A. Manufacture Horlogère Suisse. Their logo includes the byline Manufacture Horlogère Suisse depuis 1793, Swiss watchmakers since 1793, a reference to the foundation of Fabrique d'horlogerie Benguerel & Humbert in 1793. Copyright © David Boettcher 2006 - 2019 all rights reserved. This page updated February 2019. W3CMVS.